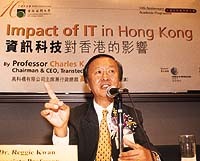 'The Impact of IT in Hong Kong' was the theme of a public lecture by Prof. Charles K Kao, internationally recognized as the 'Father of Fibre Optics Communications'. The event was organized by the School of Science and Technology as part of its Tenth Anniversary Celebration programme. IT has led to the creation of a global village and increased communications. Individuals' horizons are broadened, they are empowered and hence grow intellectually, according to Prof. Kao. The increasing interdependence of large and small enterprises resulting from IT has also accelerated the development of global trade and the accumulation of wealth. He predicts that IT will bring many changes in our lives. Very soon, voice-activated machines, three-dimensional presentation and interactive computers will become part of daily life. The emergence of the Internet will fundamentally transform our traditional mode of learning and the role of teachers. Also, E-commerce will flourish and change the way Hong Kong people shop. Businesses that cannot adapt to the IT age would disappear and the gaps would soon be filled by a new industry of IT agents, i.e., people specializing in searching for and repackaging information to sell. If Hong Kong is to take full advantage of the impact of IT, it must invest in good infrastructure, inform people about the importance of IT to their lives and encourage them to participate in the creation of IT-related services, he says. Prof. Kao is happy to see the development of the Cyberport and believes it will bring many jobs to Hong Kong. Although the problem of unemployment may become more serious in the early stage of Cyber-port's development, this can be tackled with retraining unemployed workers to do IT-related jobs. The lecture was sponsored by Cable and Wireless HKT as part of its service to the Hong Kong community.